In a head-scratching story at the end of last week, DECC and BIS made the front page of the Financial Times (registered users/subscribers can access the story). Given the front page status, you might imagine that the Smart Meter rollout had gone catastrophically wrong, or that we had mistakenly paid billions in grants to scientists who weren't getting the peer reviews that we wanted, or that we'd suddenly discovered a flaw in our model for climate change or perhaps that the Technology Strategy Board had made an investment that would forever banish viruses and malware. The BBC followed the story too. But, no. Instead we have two departments having problems with their email. 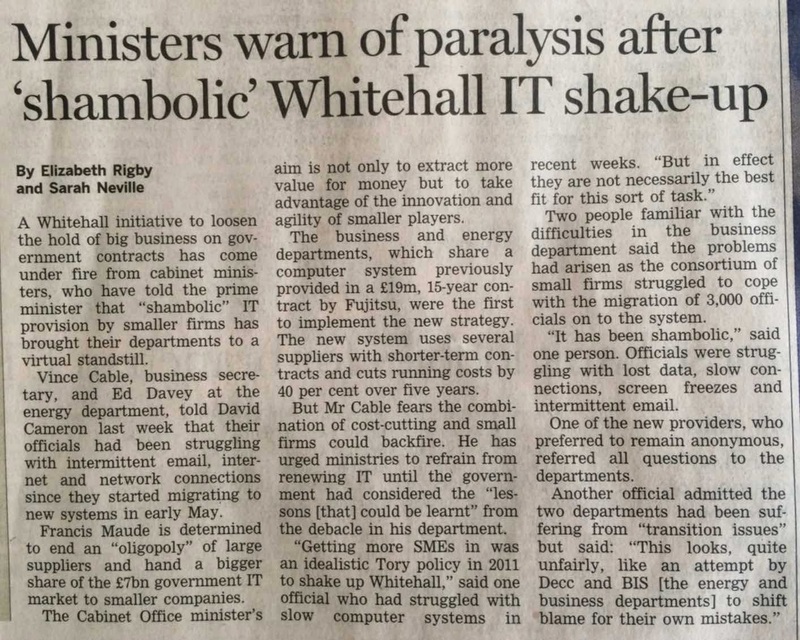 Several Whitehall wags asked me weeks ago (because, yes, this story has been known about for a month or more) whether anyone would either notice, or care, that there was no email coming to or from these departments. It is, perhaps, a good question. Business Secretary Mr Cable and Energy and Climate Change Secretary Mr Davey were reported in the Financial Times to be angry about slow and intermittent emails and network problems at their departments since they started migrating to new systems in May. The real question, though, is what actually is the story here? - Or was it about splitting up contracts and of taking more responsibility for IT delivery within departments (Mr Cable seemingly fears the combination of cost-cutting and small firms could backfire)? - Was the story leaked by Fujitsu who are perhaps sore at losing their £19m per annum, 15 year (yes, 15. 15!) contract? - Was it really triggered by Ed Davey and Vince Cable complaining to the PM that their email was running slow ("Prime Minister, we need to stop everything - don't make a single decision on IT until we have resolved the problems with our email")? - Is it even vaguely possible that it is some party political spat where the Liberal Democrats, languishing in the polls, have decided that a key area of differentiation is in how they would manage IT contracts in the future? And that they would go back to big suppliers and single prime contracts? - Was it the technology people in the department themselves who wish that they could go back to the glory days of managing IT with only one supplier when SLAs were always met and customers radiated delight at the services they were given? #unacceptable as Chris Chant would have said. In our view, the pendulum has swung too far. The Cabinet Office refers to legacy ICT contracts as expensive, inflexible and outdated; but moving away from this style of contract does not necessarily mean moving away from the large SIs. And it appears that it is beginning to dawn on some in UK Government that you can’t do big IT without the big SIs. A mixed economy approach – involving large and small suppliers - is what’s needed. By pendulum, he means that equilibrium sat with less than a dozen suppliers taking more than 75% of the government's £16bn annual spend on IT. And that this government, by pushing for SMEs to receive at least 25% of total spend, has somehow swung us all out of kilter, causing or potentially causing chaos. Of course, 25% of spend is just that - a quarter - it doesn't mean (based on the procurements carried out so far by the MoJ, the Met Police, DCLG and other departments) that SIs are not welcome. Transitions, especially, in IT are always challenging - see my last blog on the topic (and many before). DECC and BIS are pretty much first with a change from the old model (one or two very large prime contracts) to the new model (several - maybe ten - suppliers with the bulk of the integration responsibility resting with the customer, even when, as in this case, another supplier is nominally given integration responsibility). Others will be following soon - including departments with 20-30x more users than DECC and BIS. - 15 year deals that leave departments sitting with Windows XP, Office 2002, IE 6 and dozens of enterprise applications and hardware that is beyond support. - 15 year deals that leave departments paying for laptops and desktops that are three generations behind, that can't access wireless networks, that can't be used from different government sites and that take 40 minutes to boot. With shorter contracts, more competition, access to a wider range of services (through frameworks like G-Cloud), only good things can happen. Costs will fall, the rate of change will increase and users in departments will increasingly see the kind of IT that they have at home (and maybe they'll even get to use some of the same kind of tools, devices and services). - We know that, one day, the old email/network/whatever service was switched off and a new one, provided by several new suppliers, was turned on. We don't know how many suppliers - my guess is a couple, at least one of which is an internal trading fund of government. But most likely not 5 or 10 suppliers. - We also know that transitions are rarely carried out as big bang moves. It's not a sensible way to do it - and goodness knows government has learned the perils of big bang enough times over the last 15 years (coincidentally the duration of the Fujitsu contract). - But what triggered the transition? Of course a new contract had been signed, but why transition at the time they did? Had the old contract expired? Was there a drive to reduce costs, something that could only be triggered by the transition? - Who carried the responsibility for testing? What was tested? Was it properly tested? Who said "that's it, we've done enough testing, let's go"? There is, usually, only one entity that can say that - and that's the government department. All the more so in this time of increased accountability falling to the customer. - When someone said "let's go", was there an understanding that things would be bumpy? Was there a risk register entry, flashing at least amber and maybe red, that said "testing has been insufficient"? - Accountability lies with the customer. Make decisions knowing that the comeback will be to you. - Transition will be bumpy. Practice it, do dry runs, migrate small numbers of users before migrating many. - Prepare your users for problems, over-communicate about what is happening. Step up your support processes around the transition period(s). - Bring all of your supply chain together and step through how key processes and scenarios will work including when it all goes wrong. Transitions don't come along very often. The last one DECC and BIS did seems to have been 15 years ago (recognising that DECC was within Defra and even MAFF back then). They take practice. Even moving from big firm A to big firm B. Even moving from Exchange version x to Exchange version y. What this story isn't, in any way, is a signal that there is something wrong with the current policy of disaggregating contracts, of bringing in new players (small and large) and of reducing the cost of IT). The challenge ahead is definitely high on the ambition scale - many large scale IT contracts were signed at roughly the same time, a decade or more ago, and are expiring over the next 8 months. Government departments will find that they are, as one, procuring, transitioning and going live with multiple new providers. They will be competing for talent in a market where, with the economy growing, there is already plenty of competition. Suppliers will be evaluating which contracts to bid for and where they, too, can find the people they need - and will be looking for much the same talent as the government departments are. There are interesting times ahead. There will be more stories about transition, and how hard it is, from here on in. What angle the reporting takes in the future will be quite fascinating.